PT Pos Indonesia (Persero) is recognized as one of the oldest companies in Indonesia. 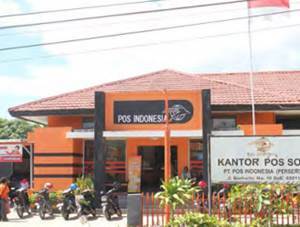 The history of POS Indonesia started on 1746 when the first post offices opened in Batavia (now Jakarta) by Governor General GW Baron van Imhoff. After several changes in status, the name of PT Pos Indonesia (Persero) was officially established in 1995. According to information found in PT Pos Indonesia (Persero) Annual Report 2017 as cited by JobsCDC.com, POS Indonesia generally recorded a good performance in 2017. POS Indonesia booked total assets of Rp7,869 billion in 2017. This total assets is up 51.64% from Rp 5.783 billion in the previous year. Total revenue in 2017 amounted to Rp5,074 billion, increased 4.05% year-on-year from Rp 4,876 billion in 2016. Referring to its report, POS Indonesia reported total comprehensive income of Rp1,696 billion in 2017. This total net profit figures reflected an increase significantly from Rp 377 billion in 2016. Have driving license class A/B (SIM A/B). Minimum D3 degree in Informatics. Have own vehicle (motorcycle) and driving license class C (SIM C). Preferably have experience in the field of IT and networking. Have own android smartphone, minimum version 6.00. Have driving license class C or A (SIM C/A). Minimum height of 160 cm for Male and 157 cm for Female. Single/not married with the maximum age of 25 years old. Physically and mentally healthy (medical certificate), not tattoed and pierced. Willing to be placed in all working areas of Kantor Pos Palembang. Discipline, thorough, honest and able to communicate well. Computer literate, minimum MS Office (Word, Excel, Power Point). Preferably have experience according to the applied position. JobsCDC.com now available on android device. Download now on Google Play here. Please be aware of recruitment fraud. The entire stage of this selection process is free of charge. 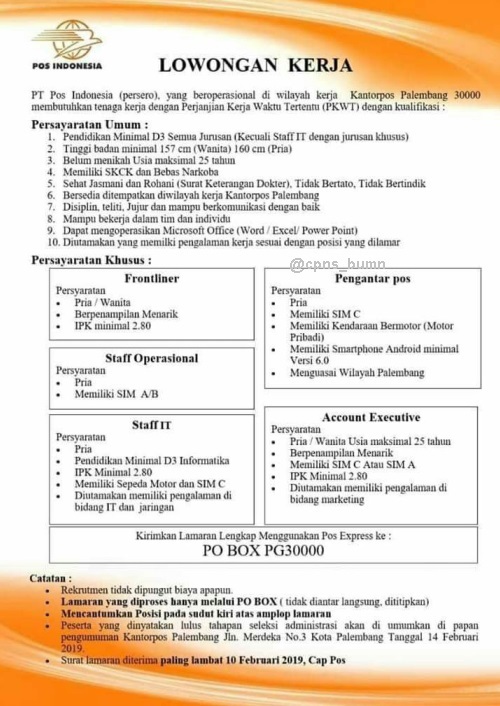 PT Pos Indonesia (Persero) - Frontliner, Operational Staff, IT Staff, Postman, Account Executive Pos Indonesia February 2019 will never ask for fees or upfront payments for any purposes during the recruitment process such as transportation and accommodation.